Do pets make you sneeze? Eyes water? Wheeze? Our friends over at Petcentric have compiled information about four awesome hypo-allergenic dog breeds that can make great pets for pet-allergic households. So even if you “Achoo!” after you pet most adorable pooches, you may not have to give up your dreams of owning a pet because of your allergies. While there’s no such thing as a fully non-allergenic dog, certain breeds produce less dander and shed less than other dogs — which will lessen the sneezes and watery eyes. Before you make the lifetime commitment to adopting any dog, you’ll want to make sure to spend plenty of time with the individual pet, as the amount of dander and shedding even within a specific breed can vary, as can your reaction to them. Some rescues can arrange for extended play dates or even overnight stays in your home, to see how you do with longer exposure to the pet you’re interested in adopting. 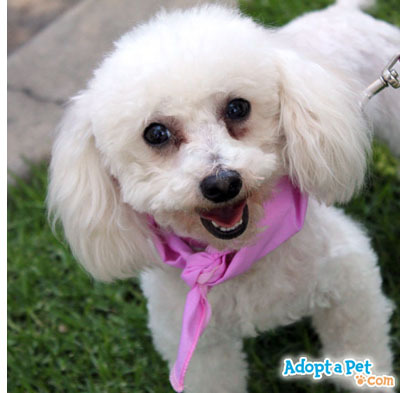 You can find adoptable hypo-allergenic dogs by searching on Adopt-a-Pet.com, click “find a pet” up at the top. don’t forget, mixes of these breeds can have the less-allergenic quality too! Now on to the four breeds! These cream-colored cuties look like giant marshmallows and have great personalities. Plus, their lush, curly coat produces less dander than the typical pooch. They do need regular grooming to keep their fur short and tidy (like us, their hair never stops growing). Originally hailing from France as circus dogs, Bichon Frises love attention and provide constant companionship to their human friends. These friendly playmates are perfect for families with young children. The Portuguese Water Dog is extremely sociable and friendly. They have a thick, wavy coat that produces little dander. This dog originated as a fisherman’s companion, hence the name. He loves water and is very active and adventurous. Since the Portuguese Water Dog is traditionally a working dog, he needs a lot of exercise and does best when given “jobs.”Because of his high energy level, the Portuguese Water Dog does best with active families. One of the most popular breeds in America, the Poodle features a curly coat that produces less dander than other breeds. However, these dogs do need regular grooming. Just like the Bichon Frise, their hair never stops growing. Poodles come in three sizes: standard, minature, and toy. These pooches love to prance and show off for their human companions. They’re also very intellgent and can learn complicated tricks due to their willingness to please — making them the perfect agility contenders. In short, they make great well-rounded pets. What’s the best way to avoid pet allergies? Choosing a dog with little hair, or none at all. Enter the Hairless Chinese Crested. These adorable dogs only have plumes of hair on their heads, tails, and feet. As a member of the toy class, they are extremely gentle and are playful companions for families. Just make sure to protect this hairless dog in the sun — like humans, they can get sunburned! These hypo-allergenic dog breeds might be perfect for a family with allergy problems. To be sure, each dog and person is different. While there are no guarantees, less dander usually means less allergens. Do you have a hypo-allergenic dog at home? Share your story in the comments on the Petcentric.com article here!